Year after year we hunt for Gingerbread Man Christmas lights. No, it isn’t that we have a lot or that we have issues with the ones we have. It is because everyone always runs out of stock very early in the buying season. And, they don’t sell outside of the holidays. When we see them, we usually grab a couple just to add to the strings we have around our home… and office. Looking at holiday ornaments over at Bronner’s, we came across these, currently in stock. 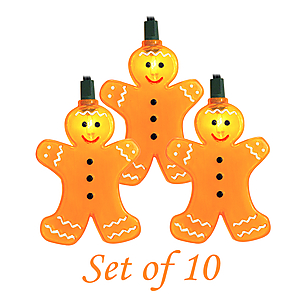 In case your looking around or need your Gingerbread Men lite up, Bronner’s has you covered… for now at least.